Cancer is a complicated illness, but the more we understand it, the likelier we are to beat it. 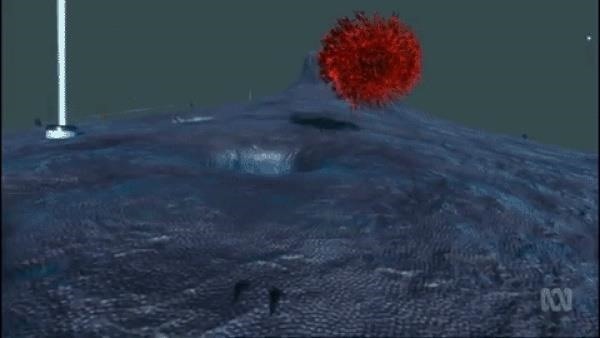 The 3D Visualisation Aesthetics Lab at the University of New South Wales took to virtual reality to help improve our odds by allowing scientists to walk through virtual representations of actual cancer cells. The project, spearheaded by the lab's director, John McGhee, uses a high-resolution electron-microscope to pull data from a cancer cell—or, really, any part of the body—and recreate it in three dimensions on the HTC Vive. This allows doctors and scientists to look at the data very closely and easily focus on specific parts. We've shown it to about four or five patients and we've had dramatic responses with some of them. We showed an 18-year-old man who had suffered a brain haemorrhage while playing football. He was a bit shellshocked by it. He was shocked by how violent and damaging the stroke was. For an in-depth look at this new technology, watch the "Journey to the Centre of the Cell" (or "Fantastic Journey", if you'd prefer) below from ABC Catalyst, which shows you what the view from inside the Vive actually looks like. The Syndey Morning Herald also has a good video you can check out. While the app only provides static image data at the moment, McGhee intends to add the flow of time and its effect on the cell in the near future. Nevertheless, it's already a useful tool in the understanding of how certain conditions look in our bodies—and it's a lot safer than the Magic School Bus method.